Our range of engraved dog tags and engraved cat tags includes a huge variety of different shapes and sizes to suit every type of dog or cat. Only high quality materials such as aluminum, nickel and stainless steel and metal alloys like rust-proof brass are used to make our engraved pet tags. You will be spoilt for choice with our broad range of engraved dog tags and engraved ID tags for cats. Are you looking for a simple engraved pet tag made of plain brass or stainless steel? Our sturdy but stylish brass and stainless steel engraved pet tags are a great choice for all outdoor loving cats and dogs. Or perhaps you prefer an engraved dog tag featuring bright and colorful images? Or the pampered pooch or kitten may like a stylish engraved pet tag with sparkling Swarovski crystals? With our huge range of pretty bows, hearts, glitter tags and bling tags, you are sure to find an pet tag to suit every dog or cat! 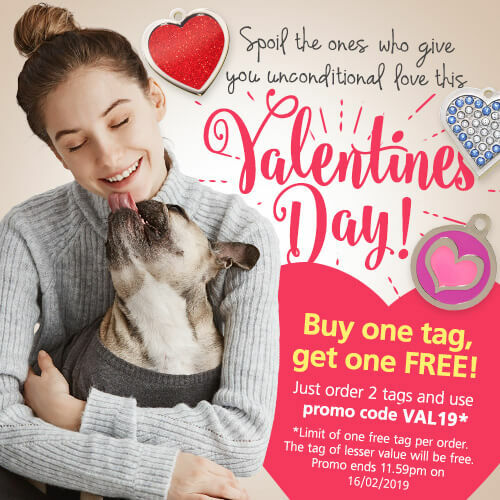 Whether your dog is an active Cocker Spaniel, a spoilt Pug, smart Poodle or a fun loving French Bulldog (Frenchie), we are sure you will find the right engraved dog tag for your pooch on our website. See all engraved dog tags. Looking at an engraved pet tag for your cat? 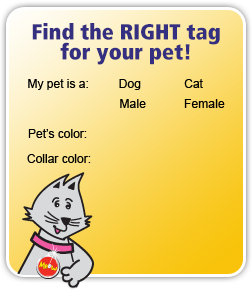 Here at Pet-tags.com, we offer many different styles of engraved cat tags to suit every cat, from the loveable Birman Cat to the easy going Scottish Fold Cat and the popular Siamese Cat. See all engraved cat tags. To make life easier, attach your engraved dog tag or your engraved cat tag to your pet's collar with our lightweight eZeClip attachment. All engraved dog tags and engraved pet tags for cats are supplied with a strong split ring for attachment to your pet's collar. We use state of the art laser engravers for all our engraved dog tags and engraved pet tags for cats and give a guarantee for 5 years against breakage and fading*. (*Conditions apply). Generally we recommend for the pet’s name plus one or two contact numbers to be engraved on your pet’s tag. 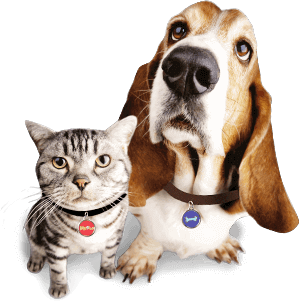 Most pet owners prefer not to include an address on their engraved pet tag for security reasons. Many of our engraved dog tags and cat tags can be engraved both on the front and back of the tag, and you can choose what information goes on each side of your engraved pet tag when you place your order. Engraved dog tags and engraved cat tags that feature images on the front can only be engraved on the back of the pet tag. The more information you require, the smaller the text will be on your engraved pet tag. As our engraved dog tags and engraved cat tags are deeply laser engraved, your engraved pet tag/s may arrive with a bold finish. If this is the case, simply wipe over your engraved pet tag/s with a cloth (e.g. polishing or jewelry) to smooth over the engraving and remove any excess fibers.